SPOKANE (Scrap Monster): The City of Rotterdam in Holland, in partnership with Dutch company VolkerWessels, is at its early stages of utilizing recycled plastic to build roads. Reportedly, engineers are working on an idea to use plastic litter collected from oceans to build plastic roads. The plastic collected from oceans will be molded into bricks. According to them, these roads would be easy to install and uninstall. The bricks with hollow space inside allows for infrastructure such as pipes and electrical cables to run along them. The design of the bricks would also enable repair works, as the roads need not be removed completely. The completely ‘plastic road’ would help to eliminate the pollution from asphalt during creation of traditional roads. It also saves the environment by offering a solution to the problem of rising plastic waste in oceans, thereby protecting marine life. 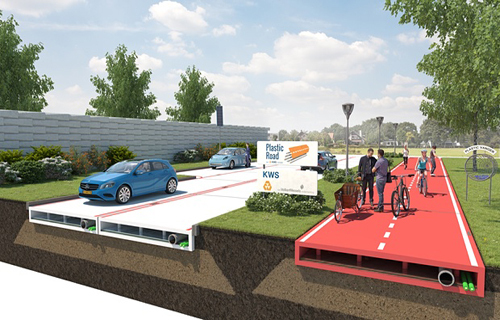 The plastic road offers a good solution when it comes to construction of roads in places where soil is not stable. However, the idea is only at its preliminary stage and needs to be tested in laboratory. It also needs to be identified, how safe such plastic roads would be in wet and slippery conditions. Meantime, VolkerWessels has invited participation of stakeholders including plastic recycling companies, universities and other knowledge institutions to contribute to the pilot project. VolkerWessels is Dutch group of companies with 15,000 employees and about 120 companies and offices in the Netherlands, the United Kingdom, Canada and the United States.